OK, I know most of you thought this blog was about baseball – and it is. But if you look at the “masthead” you’ll see that it also mentions travel. Yes, but that was just about the oddities that occasionally pop up along the way between games, right? Well, yes, that’s what it has been to this point, but now it is time to get serious about the travel part. So I recently went to Tanzania and Zambia to look at an innovative new program that Mercy Corps is implementing there (as well as in Kenya) with a $25 million grant from MasterCard Foundation. It is based on the simple observation that between 65 and 70% of rural farmers in most parts of Africa have cell phones. So what, you ask. Well, as MPesa has demonstrated in Kenya, money can be made by turning cell phones into checkbooks and ATM’s so that folks can pay bills, deposit money in a mobile or savings account or do many other things that you’d normally have to go to a bank to accomplish. So Mercy Corps’ task is to convince bankers, who are interested in making money but are also congenitally conservative, that there is a huge number of rural folks in Africa who could be customers at very low cost. They wouldn’t have to build lots of new branches or hire lots of staff. All they have to do is make use of the cell phones the farmers already have in order to bring them into the fold. That’s where the phone companies come in – they also want to increase their revenue, and the more traffic that flows over their lines the more money they make. So MC’s work is filling the gaps – persuading the banks they can make money off the deal, the telcos they can add to their services and make a profit, the farmers that they can increase their productivity (and thus their profit) by adopting the new technology. The program has already begun in Kenya and is rolling out in Tanzania and will soon begin in Zambia. There have already been measurable results in Kenya showing significant income improvement for farmers, so this could have a wide-reaching impact on the reduction of poverty in an area where agriculture is the backbone of the economy. Farmers will be able to order seed on line (instead of having to settle for the often low quality seed the local merchant stocks – usually at a high price) and get it within 24 hours (kind of an Amazon for rural farmers) and perhaps most importantly, will get information like a county extension agent might provide – when to plant, which crop might do best in a particular area, what fertilizer or pesticide to use and so forth. This is one of the most innovative and impactful programs I’ve seen in my many travels through the Mercy Corps world and it holds great promise for other parts of the world as well. So I don’t have any pictures of Tanzania (what other country can boast of a main city with as cool a name as Dar es Salaam – place of peace?) or Zambia because I spent all my time (most of it anyway) in meetings with banks and telcos. I did get out to the countryside briefly in Zambia and met some interesting farmers and aggregators (kinda like our feedstores). Lusaka, the capital of Zambia, is a lovely city made more so by all the flowering (lavender) jacaranda trees, and Dar es Salaam is quite prosperous looking as African cities go (though the majority of the population lives in the country in poverty. My last day there (a Saturday) I didn’t have any meetings and was able to take a day trip by ferry to Zanzibar. It used to be a separate country and was a famed slave trading center for east Africa up into the Middle East and over to India. It is an island off what used to be called Tanganyika and the two merged in the 1960’s to become Tanzania. It is now called “semi-autonomous,” which seems to be an understatement. I had to present my passport to be stamped both going and coming as well as going through customs inspection that is far more rigorous than you see at most international airports. Also, Zanzibar is heavily Muslim while the mainland is primarily Christian, so all in all, it is a strange fit. But the main town, Zanzibar City, and its ancient center, Stone Town, is an interesting contrast to the more conventional mainland. 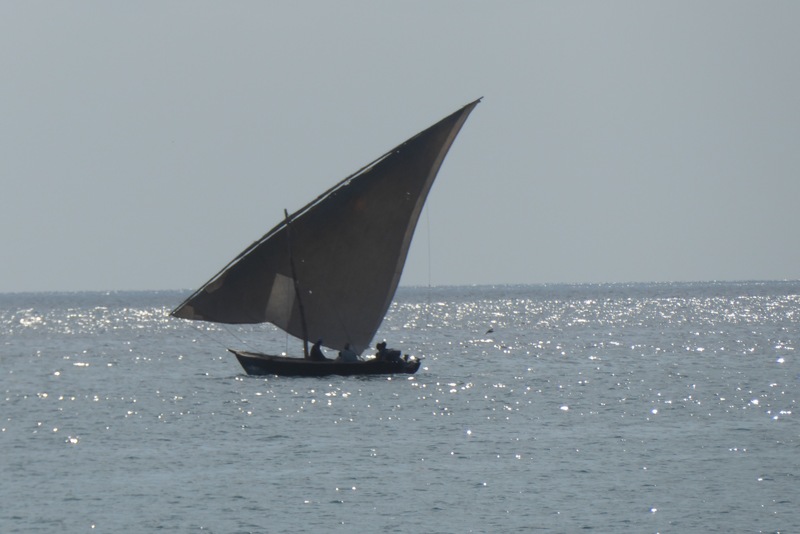 A traditional dhow in the bay at Stone Town.